The FOMC will meet today and tomorrow. Given that there has been little news that would change the economic forecast, the Fed is likely to continue "tapering" - the monthly reductions in the size of asset purchases that began in December. This meeting may be important though. First, this will be the first FOMC meeting chaired by Janet Yellen. Second, with the unemployment rate at 6.7% and falling on trend, the Fed's 6.5% threshold will soon be passed, so the FOMC will have to come up with a new framework for forward guidance. Q. You have advocated replacing the Fed’s current guidance on interest rates, which is linked to a specific unemployment rate, with a less specific description of objectives. Isn’t that necessarily a less effective kind of guidance? A. Back in 2011 the qualitative guidance wasn’t strong enough and so we went to the data-based concrete guidance and I thought that whole period was very successful. We had a disconnect between our views of where the policy was going and what the market thought. We used some pretty strong language saying what our intentions were and that seemed to work pretty well. I think that was really helpful and in many ways successful. As we’ve gotten away from truly extraordinary times and we’re in a transition toward somewhat more normal times, then the argument for trying to put out this really strong signal about, ‘We’re not going to raise interest rates until we see this one thing happen or this other thing happen,’ I don’t think is the right approach because it puts way too much attention on one aspect of the data. My preference would be to see us moving to describing our policies in our statements much more consistently and clearly. Here are our objectives, here’s where we are relative to them, and given this progress that we’ve made, here’s the policy stance we’re taking and here’s how we’re going to adjust this going forward. If that’s more the approach we’re going to take it would be vaguer or more general than a number. But I think it would be more accurate. So, Williams says that we went through some "extraordinary times" that required unusual forward guidance. According to him, that unusual forward guidance worked. But now times are not so extraordinary any more, so we need more ordinary forward guidance. This forward guidance will be "vaguer" but will somehow reveal how the Fed thinks about the world, so that private sector decision makers can confidently predict how the Fed will behave in particular situations. Economists have learned that expectations play an important role in determining economic outcomes. When businesses and households have a better understanding of how monetary policy is likely to evolve, they can make more informed spending and financial decisions. If policymakers can reduce uncertainty about the course of monetary policy, the economy is likely to perform more efficiently. A somewhat different rationale or view of forward guidance is that it is a way of increasing accommodation when the policy rate is at or near the zero lower bound. Some models suggest that when you are at the zero lower bound, it can be desirable, or optimal, to indicate that future policy rates will be kept "lower for longer" than might otherwise be the case. Thus, policymakers may want to deliberately commit to deviating from what they would otherwise choose to do under normal conditions, such as following a Taylor-like rule. In these models, such a commitment would tend to raise inflation expectations and lower long-term nominal rates, thereby inducing households and businesses to spend more today. The FOMC has not been clear about the purpose of its forward guidance. Is it purely a transparency device, or is it a way to commit to a more accommodative future policy stance to add more accommodation today? This lack of clarity makes it difficult to communicate the stance of policy and the conditionality of policy on the state of the economy. So, Williams thinks that extraordinary forward guidance was a success, but apparently Plosser doesn't agree. He thinks that, in the private sector, people were confused - they couldn't figure out whether the Fed was speaking ordinary forward guidance or extraordinary forward guidance. Here's what I think is going on. 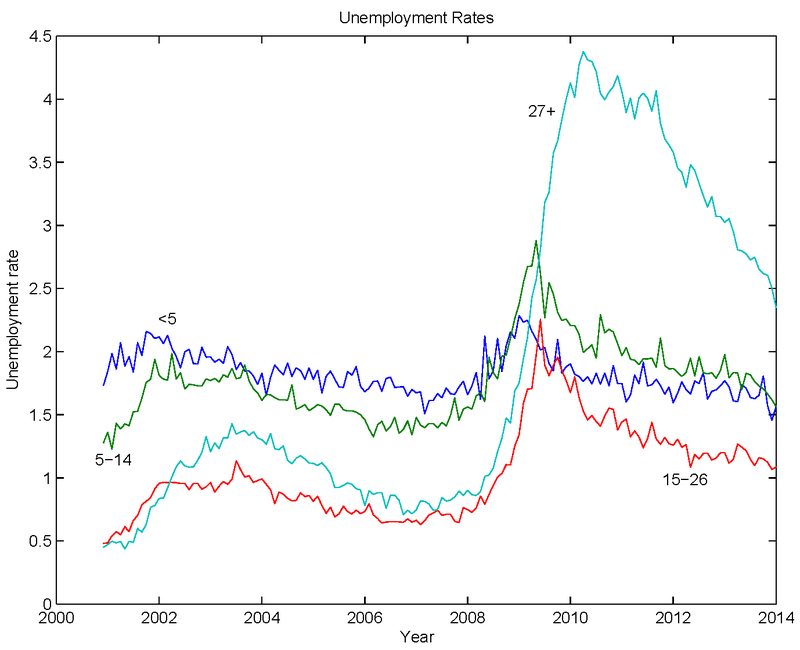 Post-financial crisis, the Fed was under a lot of pressure to do something about the state of the labor market. At the zero lower bound, "doing something" meant doing something extraordinary, and one of the extraordinary policies the Fed adopted was a form of forward guidance. That policy received support from the academic work of Mike Woodford and coauthors. In New Keynesian (NK) models, forward guidance is a commitment to future policy actions that are not time-consistent - once the future arrives the central bank would choose a different policy action if it could. To provide stimulus at the zero lower bound, according to NK models, the central bank would need to commit to a future path for the nominal policy rate that would remain lower than it would otherwise be (given previous Fed behavior) for a longer period of time. It could be that the Fed's motivation was wrong. Maybe NK models are a poor guide for monetary policy. But, suppose that we think NK models are the cat's meow. Then, for forward guidance to work, the FOMC would have had to clearly communicate: (i) what they were committed to; and (ii) that they were committed. The FOMC first announced that the policy rate would be low for an extended period; then, the policy rate was to be low at least until some calendar date; then that calendar date changed; then a threshold was announced in terms of the unemployment rate; then the FOMC started saying things about how the threshold didn't matter, and Fed officials began discussing other labor market indicators - the participation rate, the employment/population ratio - that might matter for its decisions. So, private sector individuals who care about these things would have a right to be confused about whether any commitment existed, and what the commitment was about. Thus, I'm very puzzled as to why Williams is calling the FOMC's extraordinary forward guidance experiment a success. But, extraordinary forward guidance is now history, and hopefully we'll never revisit that experience. The FOMC is currently concerned with the nature of current and future ordinary forward guidance. If we want to make a prediction about the nature of what will show up in the FOMC statement on Wednesday, a good guess is that this will the "vague" guidance that Williams envisions. Plosser, who is on the other end of the spectrum from Williams, seems on board with that. In my opinion, vague language is exactly what is required. The FOMC should avoid making any commitments to numerical targets or thresholds for things it cannot control over the long run, and over which it may sometimes have little influence in the short run. 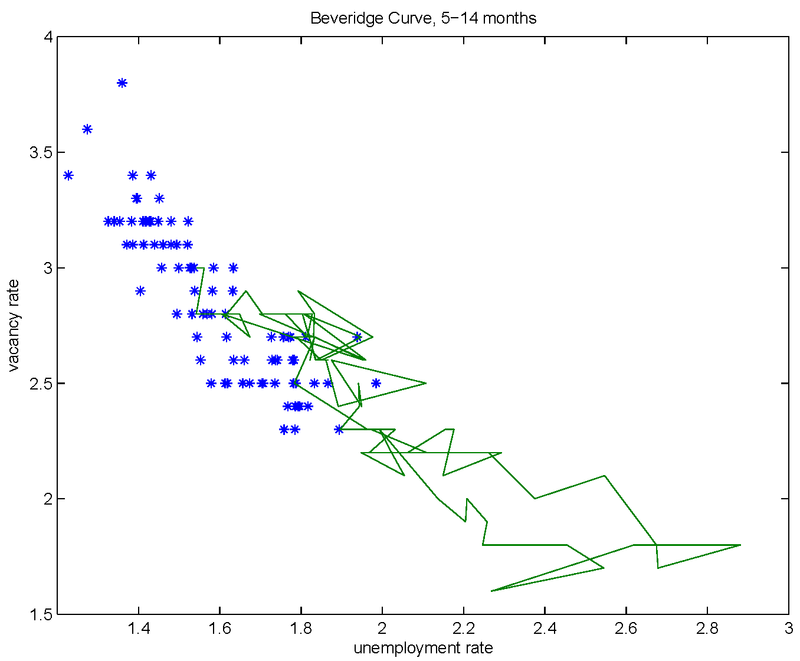 Some economists see evidence that inflation is tied to short-term unemployment. 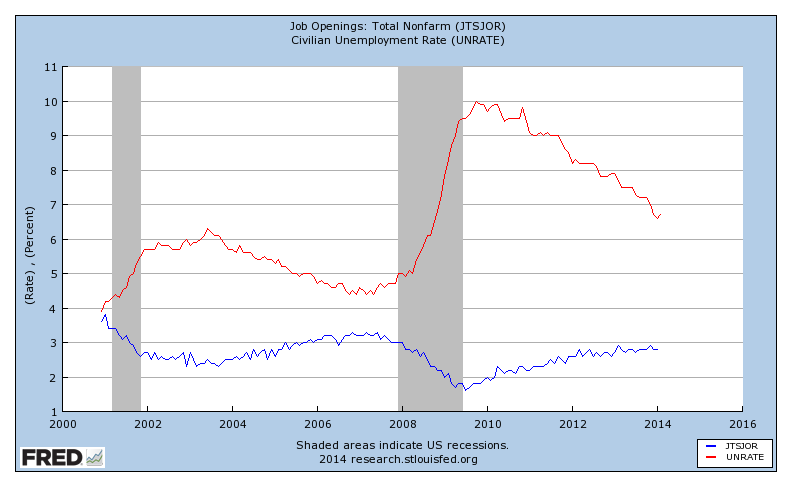 Right now we have a lot of long-term unemployment and a lot of people who have stopped looking for work. That suggests you could start to see wage and price pressures before the economy has returned to full employment. 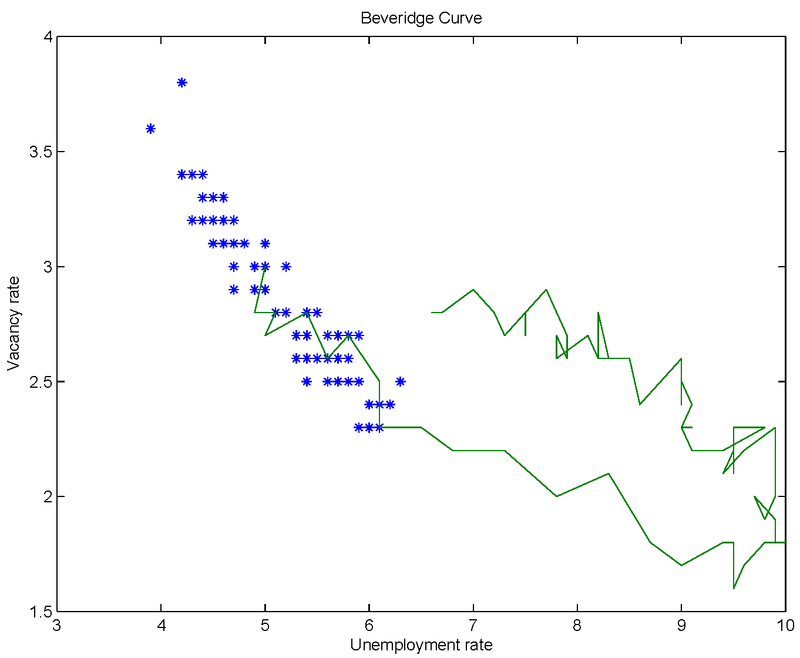 In the chart, you can see the shift to the right in the Beveridge curve, but the recent data is not as far off the pre-financial crisis relationship as it was. For those unemployed less than five weeks (currently about one quarter of all unemployment) the unemployment rate is the lowest it has been since late 2000. For those unemployed 5-14 weeks, the unemployment rate is lower than in 2002-04, and for 15-26 weeks, the unemployment rate is almost down to 2002-04 levels. 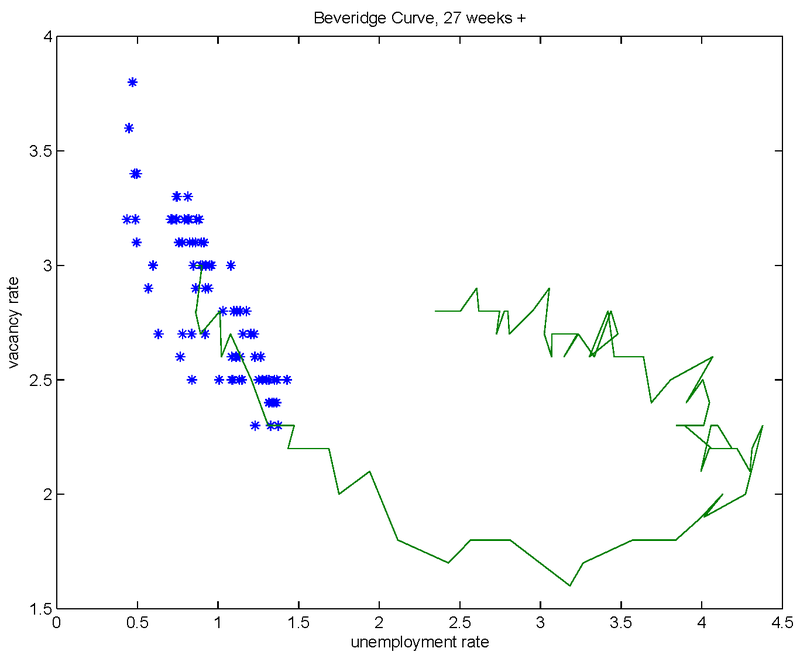 Thus, the elevated unemployment rate is coming almost exclusively from the very long term unemployed - 27 weeks or more. 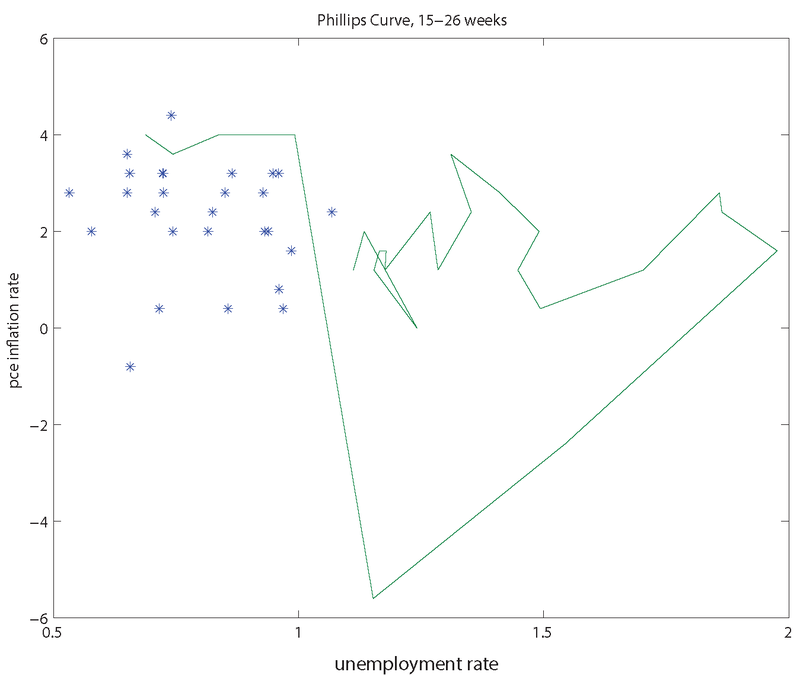 So, you may see a Phillips curve relation in that chart, but I don't - particularly in the recent data, where we have seen falling unemployment and a falling inflation rate. When Williams says that "some economists see evidence that inflation is tied to short-term unemployment," he may mean Robert Gordon. But I think Williams and Gordon should read this JEL paper by Mavroeidis, Plagborg-Møller, and Stock. The upshot of that work is that Phillips curve coefficient estimates are extremely sensitive to specification and changes in the data set. The conclusion that one should draw, I think, is that econometricians estimating Phillips curves are not estimating anything useful - the estimates cannot be taken seriously in a policy exercise. 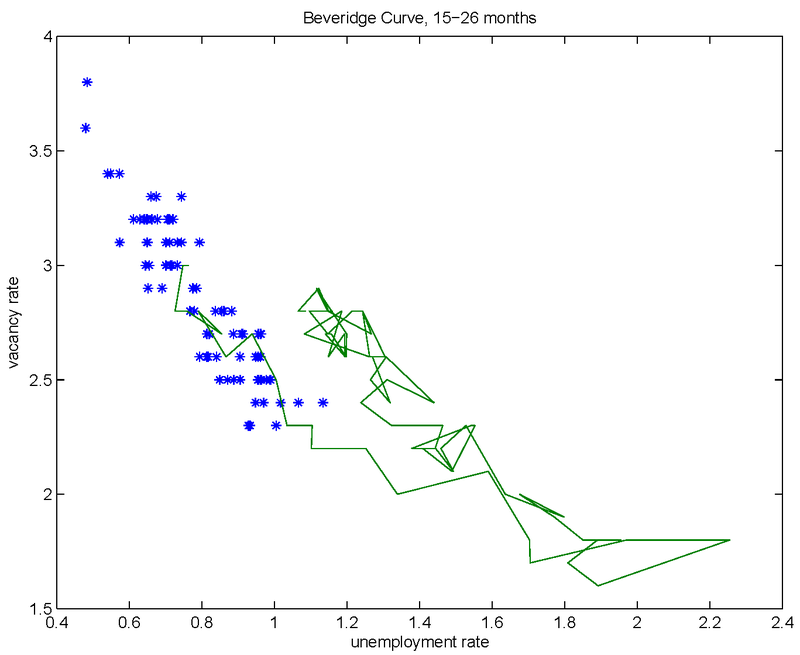 As should be clear from Williams's Q&A, recent FOMC statements, and public statements by Fed officials, the Phillips curve is alive and well in policy circles. But the weight of the empirical evidence (also see my charts in this post) makes one wonder what some people on the FOMC could be thinking. The idea that some measure of slack in the economy can help explain inflation, or predict it, appears rather foolish. 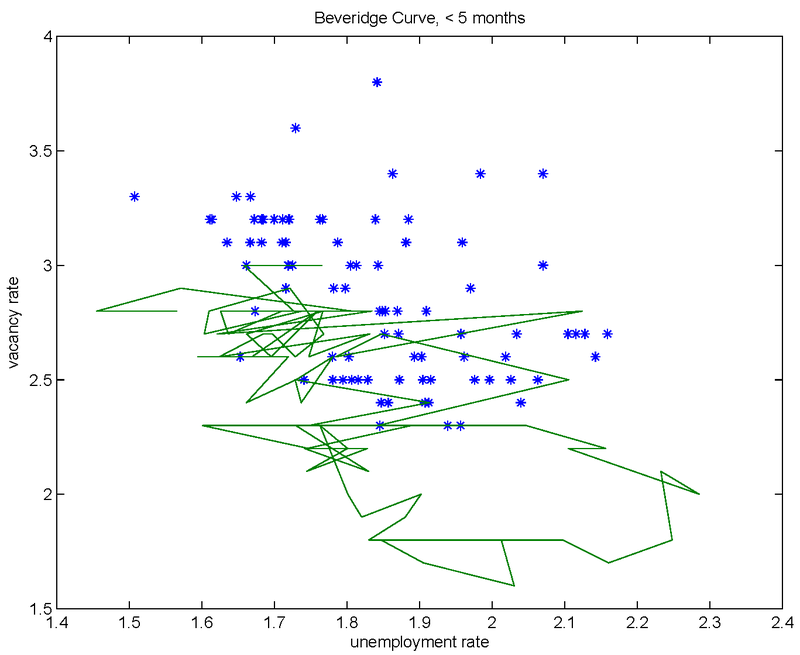 In the past, however, the Phillips curve has been a convenient fiction, which allowed the FOMC cover to increase the overnight nominal interest rate target. A persistently low nominal interest rate target ultimately produces low inflation. That's a prediction common to a wide class of mainstream monetary models, and the Fisher relation is a strong empirical regularity. If the FOMC argues that a "tight" labor market predicts higher future inflation, and that the nominal interest rate should go up when the labor market is tight, that ultimately becomes self-fulfilling. But in our current circumstances, even if we're seeing "tightness" in terms of short-term unemployment, we're not going to see significantly higher inflation as long as the policy rate remains low. Thus, it's possible that sentiments like Williams's could lead the Fed to do the right thing for the wrong reason. If the Fed wants higher inflation, the policy rate needs to rise, and this may happen if the idea catches hold with the FOMC that the labor market is tight. My guess, however, is that the idea won't actually take hold. But listen to what Janet Yellen says tomorrow. That should tell us a lot about where the committee is headed. Minor typo: "... econometricians estimating Phillips curves are not estimating anything useful ...." I think you mean "... macroeconomists estimating Phillips curves are not estimating anything useful ...."
I was told in econometrics class that we're always estimating something. It's knowing what that is that's the crux of the problem. 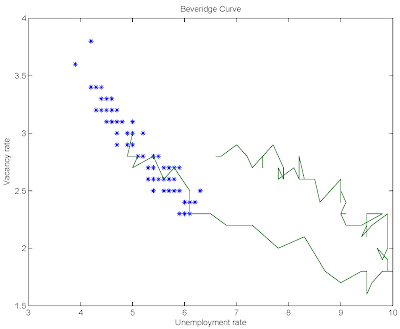 I have seen several authors plot wage growth against the unemployment rate as a kind of Philips curve. The figure looked better than yours--there was a better fit--but I am still not sure what to make of the relationship. 1. 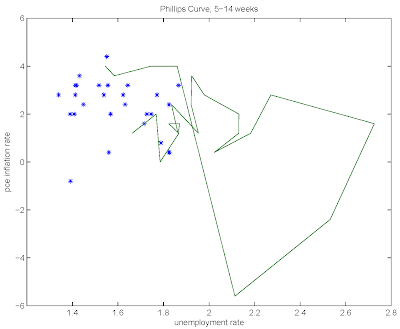 The Phillips curve the Fed seems interested in is the one they claim helps them predict the inflation measure they are interested in, i.e. raw pce inflation. 2. Aggregate wage measures are a tricky thing. There are issues to do with changes in non-wage compensation, as well as the skill composition of the labor input. "The idea that some measure of slack in the economy can help explain inflation, or predict it, appears rather foolish." Ah, but as a Keynesian economist, before the crisis, if you 'd have told me that unemployment would rise above 10%, and that the Fed would respond by reducing interest rates close to zero and by pumping $2 trillion into the economy, I would have predicted at least a large decline in inflation, and some deflation. Indeed, that's what we saw. That's predictive power. On the other hand, not to point any fingers, but many non-Keynesian economists thought that the Fed's money-printing would surely lead to a large sustained rise in inflation, even with a lot of slack in the economy. Alas, no such rise in inflation came to pass. It seems these economists didn't appreciate the inability of workers to negotiate wage increases when unemployment remained elevated. "Ah, but as a Keynesian economist, before the crisis, if you 'd have told me that unemployment would rise above 10%, and that the Fed would respond by reducing interest rates close to zero and by pumping $2 trillion into the economy, I would have predicted at least a large decline in inflation, and some deflation. Indeed, that's what we saw. That's predictive power." Since Fall 2011, pce inflation has been falling while the unemployment rate has been falling. Great predictive power. 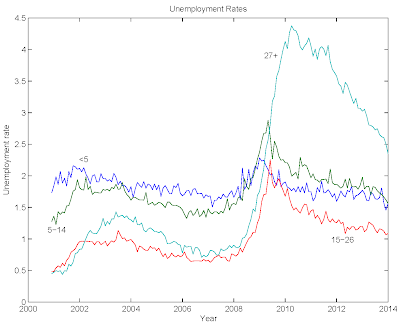 But fortunately, unemployment is not the only measure we have of the labor market. During this time, employment-to-population growth for prime-age workers has barely increased, and job growth, while very steady, has been lackluster. Additionally, GDP growth has also been slow. 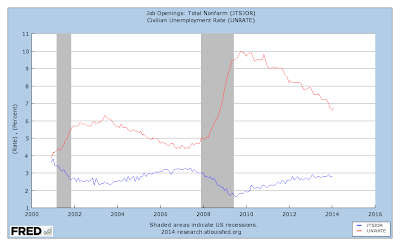 So the rosy picture we get when we restrict ourselves to just looking at unemployment is misleading. 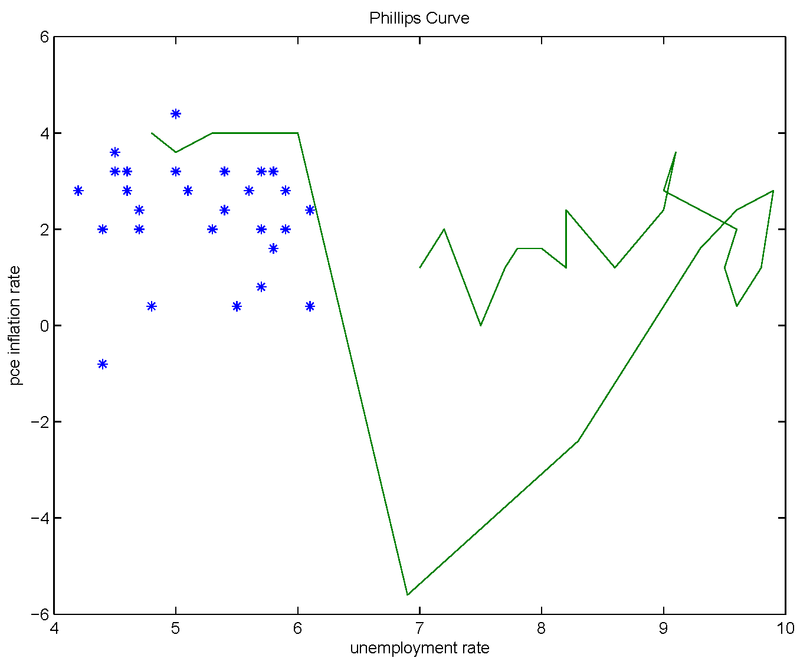 This doesn't mean that the Phillips Curve doesn't have predictive power, it means that the unemployment rate alone doesn't always tell the full story. "Since 2011, there has continued to be considerable slack in the economy and hence the Core PCE deflator has continued to be well below 2 percent. I'm struggling to see the contradiction... "
Construct your desired measure of slack, and choose your desired measure of the inflation rate. 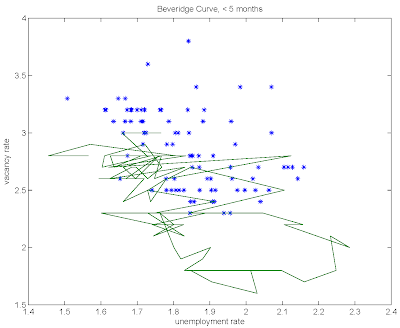 Then show me how your Phillips curve fits the data. "The hypothesis of "no relation between slack and inflation" doesn't look good from my vantage..."
Maybe if you have your eyes closed. 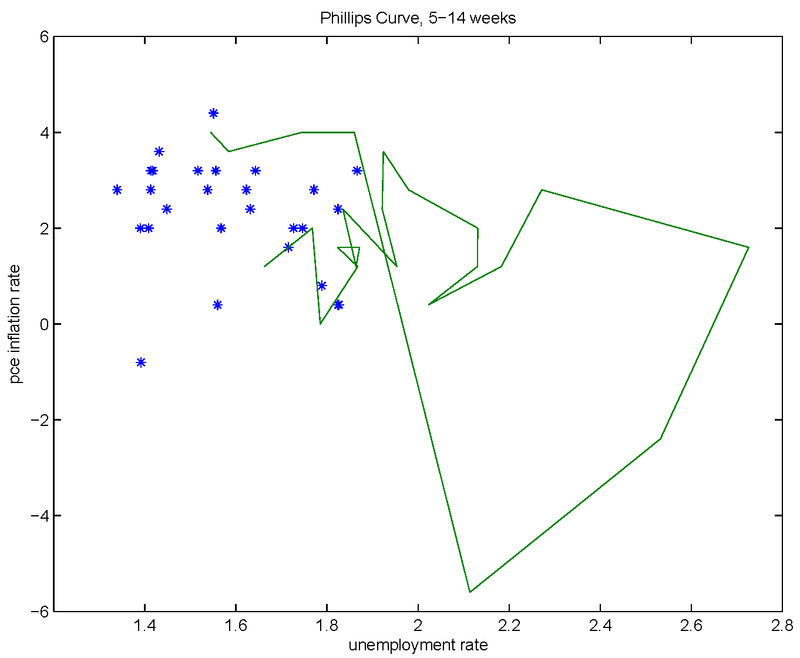 As I've said before, if you go looking for a Phillips curve relation, you can find it in the data. But, the evidence, for example the JEL paper I cited above, tells you that Phillips curves, if they don't slope the wrong way, are unstable. 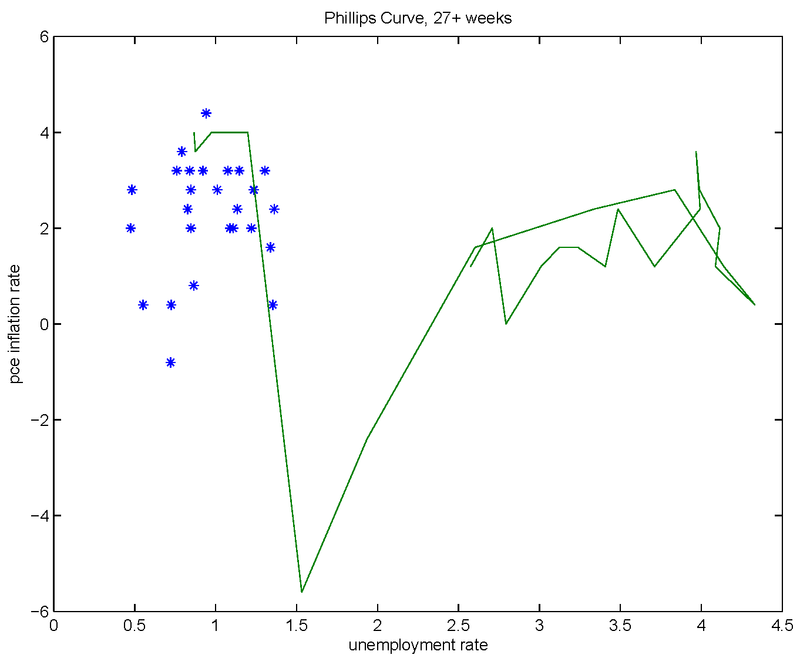 Further, you can do simple forecasting exercises that show that a monkey can do a better job of forecasting inflation that an economist equipped with a Phillips curve. By the way, my forecast for the coming year is that the Fed is going to fall well short of both its inflation forecast and its 2% inflation target. OK, than it seems we agree here on multiple points. 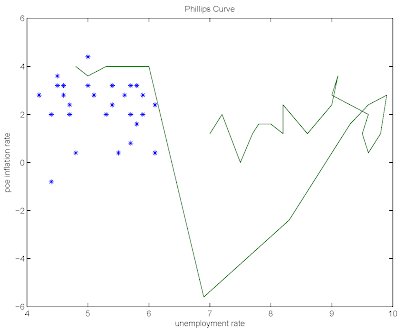 E.g., one can easily find a systematic Phillips curve-type relation if one looks. i'd also agree that they are not unstable, particularly since unemployment isn't a comprehensive measure of slack and expectations change over time. 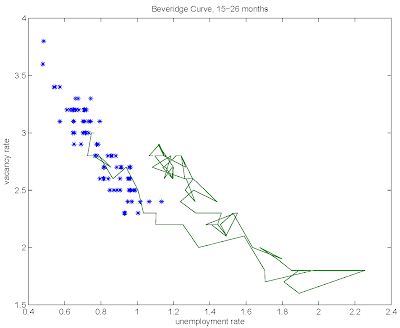 "one can easily find a systematic Phillips curve-type relation if one looks"
Not quite. If by "systematic" you mean stable, then I don't agree. In the next sentence, delete "not". And it's not easy. You have to go through a specification search, and try different data sets. You can find something, but it won't be useful. "unemployment isn't a comprehensive measure of slack"
So, what's your measure of slack? "why the Fed is tightening monetary policy..."
But they aren't tightening - not yet. "low inflation seems so clearly problematic... "
Yes, and the only way for inflation to go up is for the Fed to do what you call "tightening." "Re: the predictive power of slack." Some aggregate shocks make inflation and output move in the same direction; some shocks make them move in opposite directions. Seems we want to think about all the shocks. 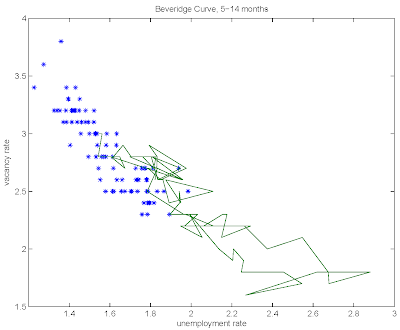 Why are you so stuck on the Phillips curve? "If by "systematic" you mean stable, then I don't agree." "But they aren't tightening - not yet." The markets read this as a tightening event. That's because it was a tightening event -- the Fed reduced purchases relative to its previous stated plan. "Yes, and the only way for inflation to go up is for the Fed to do what you call "tightening."" How do you mean? Are you in the Robert Barro camp, believing that high interest rates lead to low unemployment rather than the other way 'round? "Some aggregate shocks make inflation and output move in the same direction"
So, what shock would lead to lower GDP and lower inflation without the lower inflation operating via slack? And, why wouldn't workers be able to bargain for higher wages in a tight labor market than in a very slack labor market? Thanks for your responses, btw. "the Fed reduced purchases relative to its previous stated plan. " "So, what shock would lead to lower GDP and lower inflation without the lower inflation operating via slack? " You're thinking about it the wrong way. What you're calling slack is not a sufficient statistic that forecasts inflation. 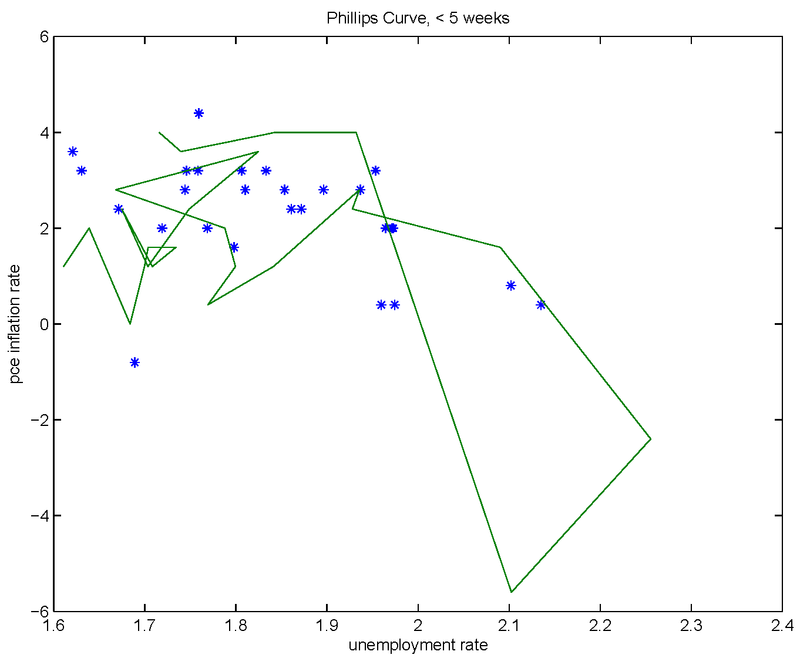 The Phillips curve is a correlation that we sometimes see in the data, and sometimes we don't see it. It's not structural. We learned that a long time ago. How is this wrong. Here are the December minutes: http://www.federalreserve.gov/newsevents/press/monetary/20131218a.htm. Since the markets read this as a tightening event, erroneously in your view = Profit opportunity for Stephen Williamson? But, I'm still quite curious what the logic is for why monetary policy tightening could lead to higher inflation? 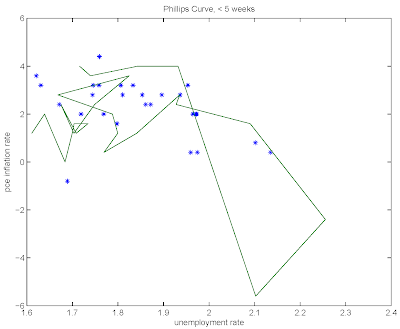 Here's a link to a Krugman post showing a Philips curve. As suggested above, this uses wage inflation, not consumer price inflation. To my mind, that is what it makes sense to use. after all, one would expect slackness in the demand for labour to show up first in the price of labour, and only later, perhaps, be transmitted to other prices. But things like a commodity price boom due to growing demand elsewhere in the world would be expected to mess up the relationship. Stephen, what you've done in that post and others is successfully argue against a stable phillips curve in which unemployment alone predicts wage growth with 100% accuracy. But nobody is arguing for such a curve, and as far as I know, nobody has argued for such a curve for at least 35 years. What you have not done is shown that slack in the economy tends to result in slower wage growth, all else equal. "If the Fed wants higher inflation, the policy rate needs to rise"
Sure and the apple does not fall to the ground but fly upwards. Thank God Yellen is at the helm of the Fed and not some voodoo economists who are wrong about everything that matters (where's the inflation you predicted as a consequence of QE? ).